Bastardization is the handmaiden of popularity -- if it weren't, jeans would never have been cut into "jorts". And when it comes to cocktails, none has been more profaned than the original Mojito, with bartenders across America pouring up glasses of foliage-clogged bathwater instead of the real thing. 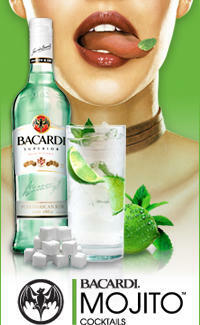 Place mint leaves, sugar and 1/2 lime in a glass. Muddle well with a pestle. Stir. Add BACARDI, then top off with club soda. Garnish with sprigs of mint, a lime wheel, or more rum.